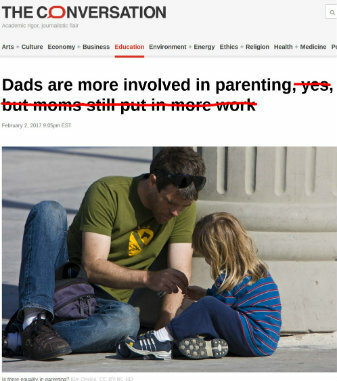 It happens constantly: news agencies and researchers publish reports using skewed data, inaccurate statements, and their own beliefs in stereotypes to come to a false conclusion: that dads don't work as hard as moms. This is terrible for women. But before we get to that, the latest example. A new piece in The Conversation is wrong from the get-go -- even the headline is false. No, moms don't "put in more work" than dads on average. Often, news agencies allow me to do response pieces setting the record straight. That was the case recently with Money, for example. Unfortunately, The Conversation told me I can only respond in the comment section, since I don't work for an academic institution. Few people read all the comments, and a response piece is necessary. So I'm writing it here. As I explain in my book All In, the false belief that dads do less than moms is prejudice against both. Executives and government leaders believe the myth. They believe that if you let a man have paternity leave or a flexible schedule to care for his children, he won't really do much. He'll kick his feet up, crack open a beer, and watch a game. So they don't allow for equal caregiving. Less than a fifth of employers offer any paternity leave. Men who do take paternity leave, or even ask about a flexible schedule, are often demoted or fired for breaking from a traditional, "macho" norm. My book is filled with these examples. For more on this, see a series of studies from the Center for WorkLife Law. 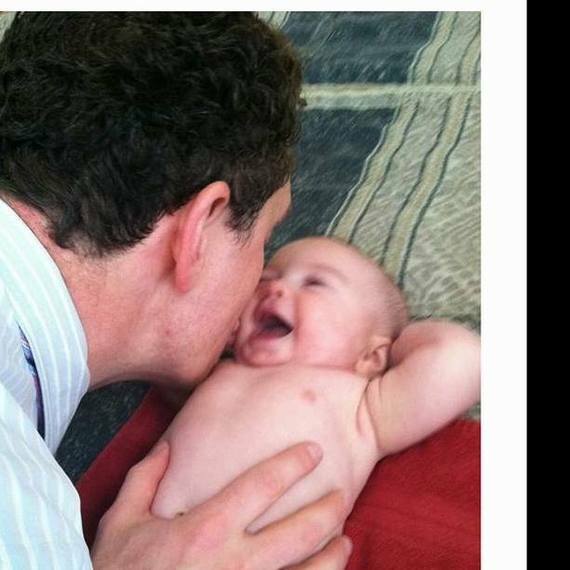 See also Forbes: Can This Man Get Corporate America To Rethink An Anti-Dad Culture? Women and men put in equal work on behalf of their families. On average, dads put in about fifty-four hours of work time to mothers' fifty-three. In two-income homes, moms work fifty-nine hours to dads' fifty-eight. In single-income homes, the breadwinner works more overall. And although the number of female breadwinners is on the rise, dads are still the vast majority of primary or sole breadwinners. Read the introduction and chapter one of All In at my website. Men want more time to do caregiving at home. Men are suffering from as much work-life conflict as women -- even more, according to the Families and Work Institute. But a combination of laws, policies, and stigmas keep them in the office more, while pushing women to stay home. So of course women do more at home. Men do more in the office. And the sexist cycle continues. Today's dads are working hard to change this. In fact, men are even more likely than women to switch jobs or careers, or move to another state or country, in order to have more time with their families. In The Conversation, Schoppe-Sullivan complains that many fathers "have not achieved equality with mothers in key areas." Imagine how offensive it would be if someone wrote that women in the workplace "have not achieved equality with men in key areas." Women are held back by sexism and Mad Men structures -- the same sexism and Mad Men structures making it harder for men to do caregiving. To fix this, we all need to work together. To justify this, she hyperlinks to a study of 100 families that was published in 1993 -- a tiny sample size from a previous generation. She also reports as fact another myth: that there is "greater day-to-day stress for mothers compared to fathers." Many of the men you know are suffering from anxiety. More than six million in the United States alone have depression, according to the National Institute of Mental Health. Stress levels are on the rise, too. On a 10-point stress scale, the average man scores a 5, essentially closing a previous gap with women, the American Psychological Association found. Men die by suicide 3.5 times as often as women -- more than 90 men a day. And the problem is global. But few people realize the mental health struggles of men, because men are less likely than women to let on how stressed or anxious they're feeling. And they're less likely to seek help. Perhaps some mothers who traveled to the D.C. march might want to recall, how many reminders and to-do lists for children and fathers did they need to leave behind? And how many text messages were exchanged with fathers about where to find a missing sport or dance class accessory? She missed the whole point. As the Huffington Post's Emily Peck reported, The New York Times apologized for its story that had falsely suggested dads don't care for their children. The Times knew that assumption was wrong, and said, "We blew it." Moms pointed out how ridiculous the Times' story was. This is just scratching the surface. In reality, the average working father spends three hours each workday with his children. Nearly 100% of dads who live with their children care for them in every major category at least several days a week, if not every day. Still, anti-dad myths live on. In order to fix a problem, you have to diagnose it. Blaming today's dads for inequalities is a misdiagnosis. Like many people in my generation, I grew up on Free To Be You And Me. Gender equality seemed like an inevitable reality. Yet here we are, decades later, and less than 5% of CEOs are women. What's holding women back is the same thing holding back men at home: The workplace didn't grow up. It's still stuck in the past. It's what prevented me from being able to stay home and care for my preemie daughter and sick wife. It's what I took on in my legal action against CNN/Time Warner. Millions of men and women have had similar experiences. That's the underlying problem. Together, today's moms and dads can change it.